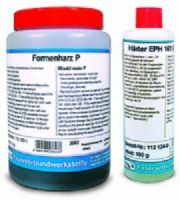 This two-component epoxy resin is coloured black for Gelcoats (applied thickness 0.5–1 mm) in mould construction with high edge strength and good polishing properties. Mould resin P is processed and cured at room temperature in conjunction with epoxy resin laminates and laminating ceramics. In contrast to resin and metal systems, the surfaces are polishable. The Gelcoat is hard-elastic, i.e. not brittle, and exhibits good edge strength. Curing time 24: hours at room temperature, followed by hot curing (together with the laminate) approx. 10 hours at 60 °C. Max. heat distortion temperature after annealing (10 hours at 100 °C) approx. 130—140 °C (for short periods, permanent approx. 110 °C).